Our ‘Geneva Terrace™’ Proven Winners® Combination is a sun-loving combination for spring and summer color with a purple/blue theme. 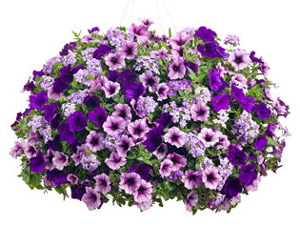 Geneva Terrace includes both Supertunia® Royal Velvet and Supertunia® Bordeaux, both of which are amazing petunia hybrids, and Superbena® Large Lilac Blue, a verbena hybrid. All will cascade from a container beautifully or will fill in a flower bed with amazing color. The plants in our 'Geneva Terrace' are grown and shipped in fine quality growing medium and are guaranteed to arrive alive and ready to thrive. "To all flower orders I purchased"
Comment: GrowJoy is very efficient and being very particular I am also very pleased and happy with my flowers from GrowJoy. Better selection than with local nurseries. Would highly recommend GrowJoy to everyone. It was my pleasure to give my review.